My children had helped me make homemade garlic parmesan spinach wraps earlier in the day, so we had to make something for dinner to go with them. Feel free to try these with regular flour tortillas, I’m sure it’ll be just as good. To be honest, I was pretty worn out from the whole cooking with your kids’ escapade and the following mass cleaning event, so I wanted to keep it simple. I chose lime chicken tacos. It’s healthy, quick, flavorful, and uses up some of the lime juice in the refrigerator that my son has taken to drinking from like it’s a sippy cup. My recipe uses cilantro, so if you’re “not a fan” as my son loves to say, it’s easy to substitute. Try using sliced green onions for a different flavor, or fresh parsley for a more mild flavor. I like lime and salt together, and that’s another area that’s easy to personalize. The amount of lime in the recipe pleased everyone at the table in its own right, but a couple of us weren’t shy about adding a bit more once we sat down to eat. The lime juice even complimented the spinach flavor in the tortilla wraps… I would have never of thought. If you come up with your twist please share in the comments. I’d love to see what you come up with. A healthy, flavorful, and easy dish that takes 30 minutes or less from the refrigerator to table. In a skillet, heat the olive oil at medium heat. Season the chicken with the salt and pepper and cook in the preheated oil for five minutes. Add the minced red onion, and garlic after the first five minutes to retain some crispness. Continue cooking until the juices run clear in the chicken and the majority of the liquid in the pan is reduced. Once the juices in the pan to add the lime juice to the pan and scrape up any bits remaining on the bottom with a spatula (flavor!). In the bowl, toss the chicken with the chopped cilantro. 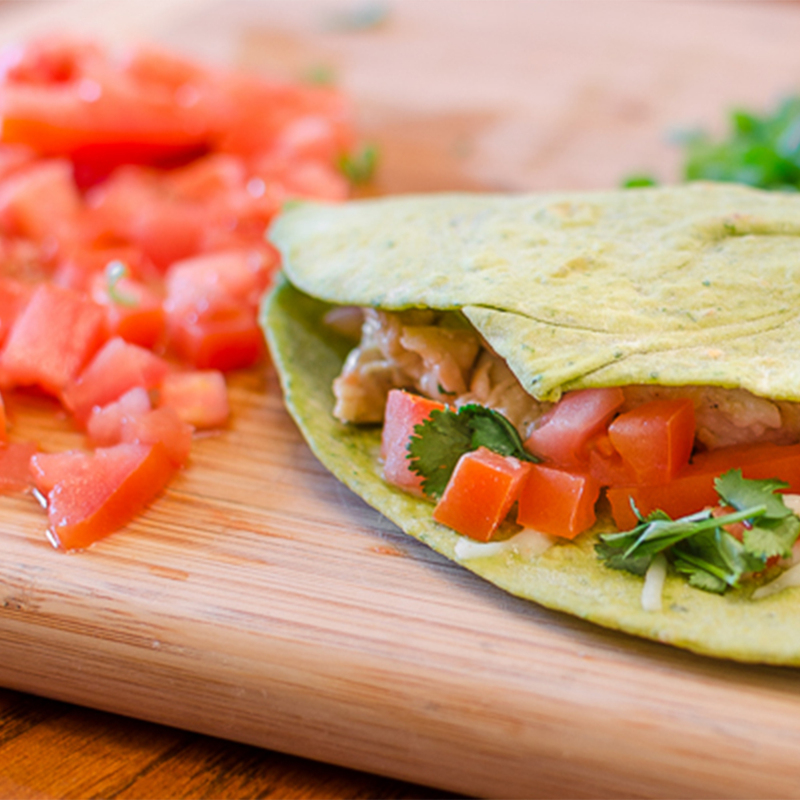 Place a tortilla on a plate: add chicken, tomatoes, mozzarella cheese, and additional lime juice to taste.